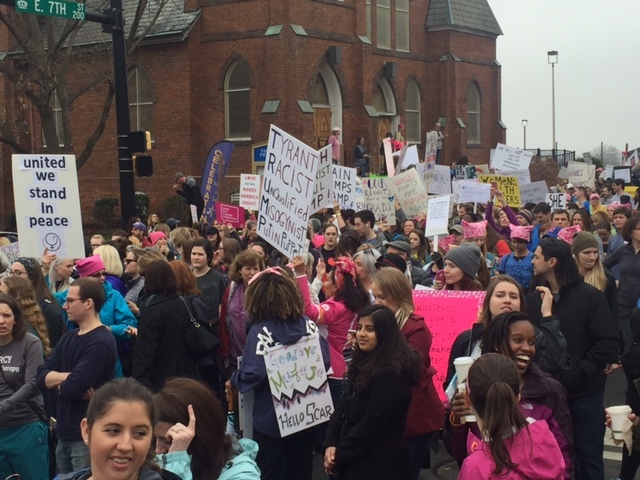 CHARLOTTE, N.C. — In this very blue city, in a state that went red for Donald Trump while sending a Democratic governor to the statehouse, a crowd estimated at more than 10,000 filled the streets at Saturday’s Women’s March. It was one of many across the country, sending a message that the story of Election 2016, far from being over, is just beginning. The winding route took marchers — more than double in number than expected — past signposts of a region that has seen its share of divisions, but has made steady if shaky progress. “I wanted to go to Washington so badly, but I’m glad I didn’t,” said Lesa Kastanas, 55. “This is our town,” she said of Charlotte, in all its complicated past, present and future. The question in a North Carolina that seems to pause but never stop fighting its Old South-New South and urban-rural battles: Where to next? Rather than moving backward to a nostalgia-tinged view of an America that was, on Saturday, men, women and children, diverse in every way, pushed forward with encouragement from others holding signs, shouting and waving from buildings and multistoried parking garages along the way. They marched past the Levine Museum of the New South, where an exhibition just ending recounts “The Life and Times of Robert Smalls,” from slave to Civil War hero to member of the South Carolina House of Representatives during Reconstruction, and another tells of a community of Hispanic immigrants in small-town North Carolina. Some signs, such as “IKEA Makes a Better Cabinet,” tried a comic approach. A group of men representing Omega Psi Phi, the predominantly African-American fraternity, offered high fives and encouragement as marchers rounded a corner. Tommy and Debbie George marched, with Debbie getting approving nods for her “Black Lives Matter” T-shirt, as did a young man with his poster reading, “Well Behaved Women Rarely Make History.” Issues ranged from civil rights to reproductive rights to immigration reform and more. “This is the most important thing she could see me do,” said her mom, Kim Weeks, 48, a Charlotte pre-K teacher. Despite dozens of candidate visits from Democrats and Republicans throughout a contentious election season, North Carolina politics are still a puzzle, even to many of its own residents. No matter how many laws on LGBT rights, voting and health care are debated and thrown into the courts and uncertainty, it remains a state split, as the country seems to be, down the middle. But Saturday’s march was a reminder that past divisions, indeed bloody ones, have often been resolved in ways no one could once have imagined, in a region at war with the nation and itself. The march ended, fittingly, at Romare Bearden Park, named for the great American artist, called “the nation’s foremost collagist,” whose well-educated African-American family left Charlotte for the North to escape the stifling Jim Crow South during the Great Migration. In a historical turnaround, Bearden is now one of the city’s most famous and honored heroes. Kastanas, a business owner and Planned Parenthood activist, came with her 24-year-old daughter Alex . Roll Call columnist Mary C. Curtis has worked at The New York Times, The Baltimore Sun and The Charlotte Observer. Follow her on Twitter @mcurtisnc3.